This easy, no-prep "We Are Thankful" banner is available in two different styles. Simple pick the style you want and print! You can print in color or in black and white to design the letters yourself. Perfect banner to decorate your classroom or hallway in November! 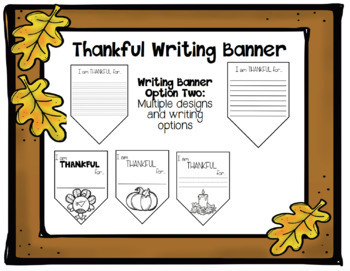 This easy, no-prep writing banner, allows students the chance to draw or write about what they are thankful for. 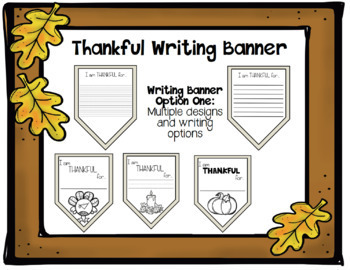 The banner can then be added to the "We Are Thankful" banner, a Bulletin Board, or simply hung around the classroom. The writing banner come in various designs and writing options. This easy, no-prep leaf cut out, allows students the chance to write what they are thankful for on paper leaves. 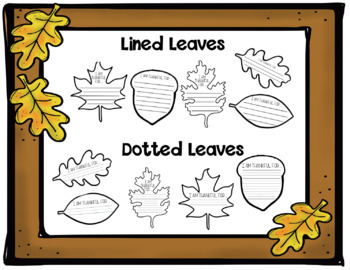 These leaves can be used to decorate Bulletin Boards or other crafts. 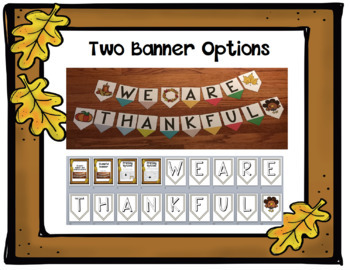 All you need to do is print the leaves on colored paper and allow students to fill in what they are thankful for.